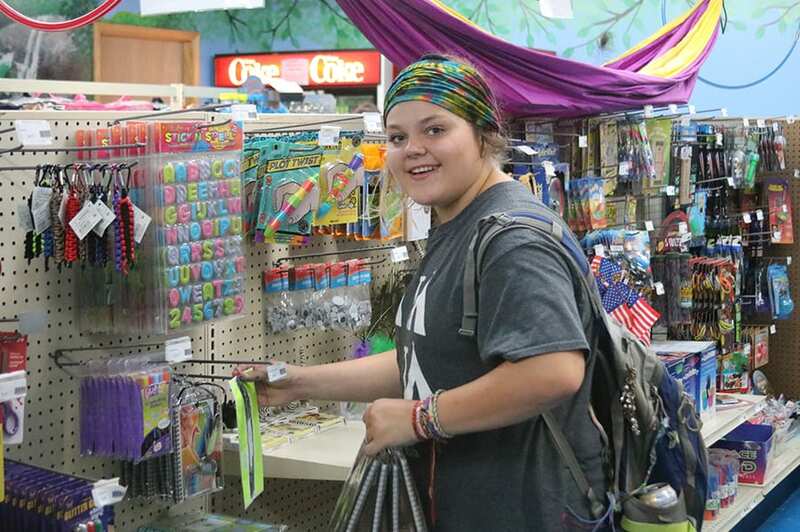 Our Store has an incredible variety of items for campers during their stay with us. Most campers (and staff) use the Camp Store for snacks during Free-Time. Our store also sells most toiletries and useful items like stamps for mail, flashlights, and batteries. What would a camp store be without FUN stuff?! Squishy balls, puzzle, magic tricks, stuffed animals, and more cover the camp store shelves! Lastly, we lots of camp apparel for those wanting to show their Cub Creek pride. Using a Store Account to Grow Confidence. Having money on account at the camp store gives campers a great problem solving tool. We try hard to make sure that we have all the major necessities such as soap, flashlight batteries and even white t-shirts for tie dying. But we also have things that campers may not think of until they face a particular situation. We have ear plugs that can help if a camper has a hard time falling asleep with the extra background noise of a cabin. We have a variety of homesick prevention and response activities that can help distract, and get past their feelings of missing home. We also have items to encourage campers to write down the contact information of their friends or even to capture memories of camp. Having a little money helps put a camper more in control of solving a problem. And this leads to growing self confidence and self esteem. We recommend $50 per week. If your camper will need to buy special foods from the dining hall gift shop, you may want to factor that in, too. We also recommend that parents do not increase this amount, just because their child spends all their money. Having an account teaches budgeting skills. 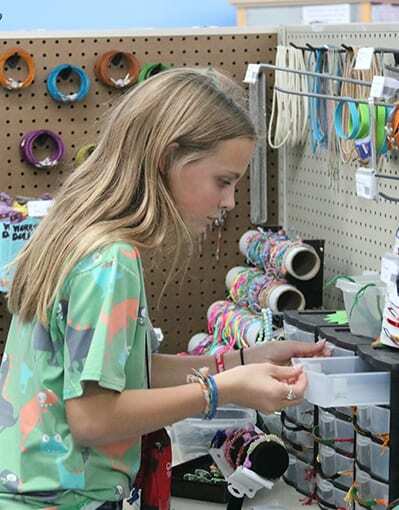 In fact, we encourage campers to earn their budgeting bead by keeping track of how much money they have on their account and keep a record of how much money they've spent. Will I receive a refund for unused money? Yes! All money over $10 remaining in your child’s camp store account will be available for pick up on the last day of camp. Please note: Amounts less than $10, refund checks not collected, and refund checks not cashed within 60 days will be placed in our scholarship account. Camp offers Care Packages for purchase. On the Check-In day at camp, you can visit our Camp Store to purchase a pre-made care package or make one yourself! We will deliver it to your camper on the day of your choosing from there. Coming soon, we'll be offering Care Package ordering ONLINE! This way, you can make a Care Package before or during your camper's session from the comfort of home!